Q: What is “fee fii fo fum”? A: It’s Ita Buttrose’s thpone number. – That nerd woman is throlling me for almost a year. What should I do? Deck the halls with boughs of throlly. @72rd 0419. Give her a good pounding in the AIC, and see if she still will grant you PIS. Nmemonics – AIC = Auxilliary Input Channel. ………………….PIS = Priority Input Status. Na yu kisim wanpela gutpela Niu Yia ah. Happy Christmas ladies and gentlemen. And you have a good new year Hey! Actually. Seeing it is Japan. Let’s be of good chair. Throbbing? Thanks for the Viagra, Santa. Fool me once, shame on you. Fool me Throllce, shame on me. UCity | 8:42 am: But don’t drink too much and get throne out with the wrapping paper. Oh time bomb, oh time bomb, how lovely are thy branches. Santa slides dow the chimney, and finds a beautiful naked blonde lady trimming the Christmas tree. Give your wife a surprise for Christmas. Put Glad-warp over the toilet bowl, and put the seat down, so she won’t notice. Marry Wonderfully Throlling Chris, Max. And happy! Hmm. I just had a thought. Maybe that is Not the one I live in. Intellesting. Half the text vanished. 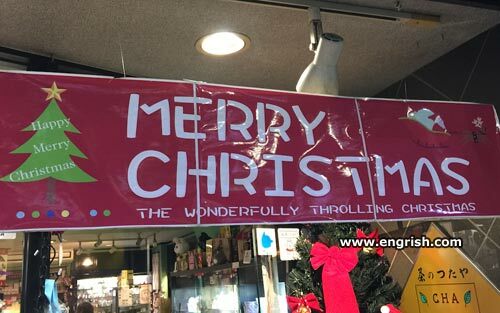 Only one Christmas Engrish this year? But I can thtill throll you on teh forumth!